Beans on toast seems to be a thing throughout the UK and although the idea sounds delicious canned baked beans are just not something I eat. But then I came across Jamie Oliver's recipe, which featured fava beans and peas, and I thought why not try it. 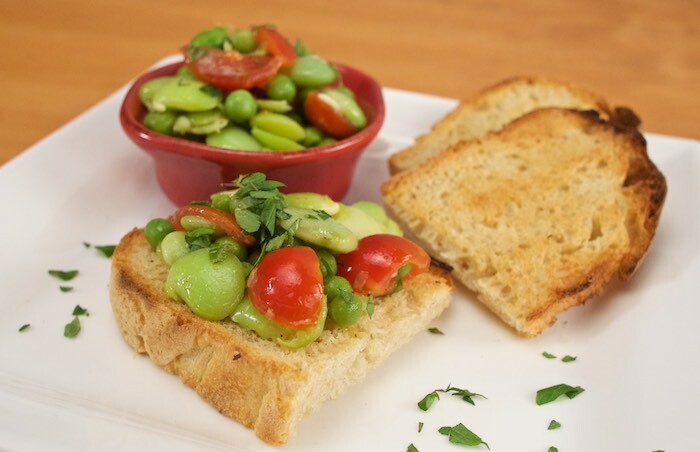 Posh Beans on toast can be enjoyed as a healthy snack, appetizer or even light lunch. Beans are a wonderful source of protein and if eaten without bread this recipe is a delicious low-carb option. Finely slice the spring onion, and place the green pieces in a large bowl. Add the tomatoes along with 6 tablespoons of oil, the zest from half the lemon and most of the juice. Season with salt and pepper, and set aside. Place the fava beans and peas into a pot of boiling salted water, then blanch for 2 minutes. Using a slotted spoon, transfer the beans and peas to the bowl of green onions and tomatoes. Add the mint and toss well to combine. Pile the mixtures onto the toasted bread and serve. This is something new to me! This "posh" recipe looks just homey enough for me to dive right on in ;) I've never actually had beans on toast before, but this certainly looks delicious! Oh I love the idea for future summer appetizers or light dinners! I love the idea of the beans and peas together! This will be a great appetizer! I've had lots of things on toast, like creamed corn or creamed mushrooms, but never beans. Looks yummy.